Hall, Roger. "Upper Canada". The Canadian Encyclopedia, 26 September 2017, Historica Canada. https://www.thecanadianencyclopedia.ca/en/article/upper-canada. Accessed 23 April 2019. 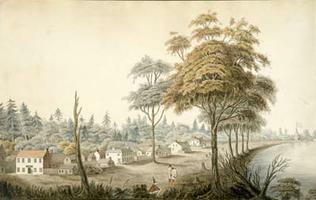 Watercolour by Eliazbeth Hale, 1804 (courtesy Library and Archives Canada/C-40137). 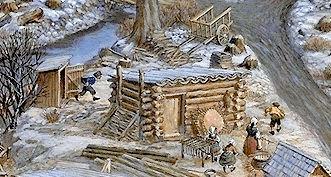 Log cabin (artwork by Lewis Parker). 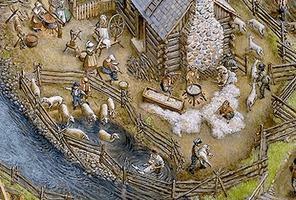 Shearing sheep (artwork by Lewis Parker). 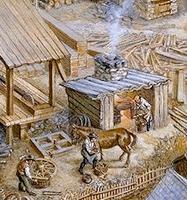 Blacksmithing in Upper Canada (artwork by Lewis Parker). Sawmill (artwork by Lewis Parker). Simcoe only resided in the province from 1792-96 but had a profound influence on its early development (miniature in watercolour, courtesy Metropolitan Toronto Library). Upper Canada, the predecessor of modern Ontario, was created in 1791 by the division of the old colony of Quebec into Lower Canada in the east and Upper Canada in the west. 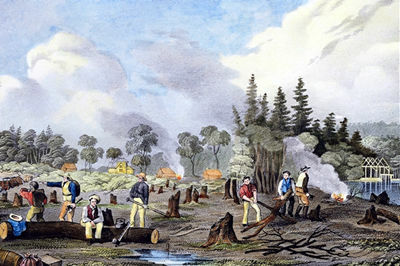 A wilderness society settled largely by Loyalists and land-hungry farmers moving north from the United States, Upper Canada endured war with America, an armed rebellion, and half a century of economic and political growing pains until it was merged again with its French-speaking counterpart into the Province of Canada. 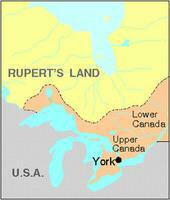 The area that became Upper Canada was populated originally by First Nations people (eg, Huron, Neutral, Petun, Algonquin). Samuel de Champlain visited the region in the early 17th century — claiming the territory for France — and was followed by other French explorers. Missionaries were particularly active in Huronia — east and south of Georgian Bay (see Ste Marie among the Hurons). 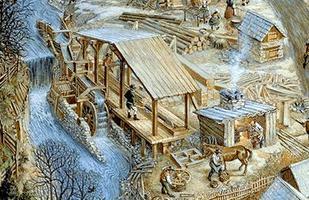 Through the fur trade, the French established themselves in the area by the 18th century. Permanent European settlement was scarcely a feature of the occupation, although the beginnings of what became modern Toronto, Windsor, Niagara and Kingston were established. During the Seven Years' War (1756-63) the French abandoned most of the region to the British, and upon the surrender of Montréal in September 1760, Britain effectively took over the territory which would later become Upper Canada. After the Treaty of Paris (1763), the borders of Britain's new Province of Quebec were extended south into the Ohio Valley. When the American Revolution began, the permanent European population of western Québec consisted of a few French-speaking settlers around Detroit. By the end of the American revolt in 1783, what had been a trickle of wartime Loyalist refugees into the area became a stream; 5,000-6,000 migrants set a tone and fashioned a British-centered ideology that would influence much of Upper Canada's future. The old Loyalist myth has these sturdy newcomers overcoming hardship and deprivation but, in fact, few refugees anywhere have been so privileged. Governor Sir FrederickHaldimand began Loyalist settlement initiatives, establishing militia units in ranges of quickly-surveyed townships stretched along the American frontier; in the event of war, these veterans were intended to form a defensive barrier. Three main areas were selected: along the St Lawrence, around Kingston and the Bay of Quinte, and in the Niagara Peninsula. A fourth, near Detroit, was considered, but its scheduled surrender to the US postponed development. Land was granted in lots, with heads of families receiving 100 acres (40.5 hectares) and field officers receiving up to and eventually more than 1,000 acres (405 ha). Clothing, tools and provisions were supplied for three years. Such conditions favoured the Loyalist migrants, many of whom did well. Many disgruntled Americans — some simply "land-hungry" — moved north to join them. By 1790 western Québec had a population of nearly 10,000 settlers. The Loyalists who came to Upper Canada, mostly American frontiersmen, were well able to cope with the rigours of new settlements. In addition, they were not politically docile. Many had been in the forefront of political protest in the old American colonies, and although they had not been ready to take up arms for colonial rights, they were prepared to use every legal and constitutional means at their disposal to better their lives. It was their constitutional complaints that caused Britain in 1791 to modify the inadequate Quebec Act of 1774. The result was the Constitutional Act of 1791. The Act divided the Province of Quebec into Lower Canada (on the lower reaches of the St. Lawrence River) and Upper Canada, along the present-day Ontario-Québec boundary. The Act also established a government which would largely determine the colony's political nature and which, in practice, strongly influenced its social and economic character. The Act was a direct response by London to the American Revolution. As the British government saw it, the excess of democracy that had permeated the American colonies would not be allowed in the two new provinces of Upper and Lower Canada. A lieutenant governor was established in each province, with an executive council to advise him, a legislative council to act as an upper house, and a representative assembly. Policy was to be directed by the executive, which was responsible not to the elected assembly but to the Crown. 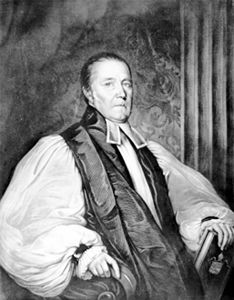 It was hoped that the Church of England would tie the colonies more firmly to Britain: in Upper Canada, a permanent appropriation of funds "for the Support and Maintenance of a Protestant clergy" was formally guaranteed by the establishment of one-seventh of all lands in the province as clergy reserves, with the proceeds from their sale or rental going to the church. Subsequent instructions established crown reserves on another seventh of the land, the revenue from which would be used to pay the costs of the provincial administration. Land ownership, the question that concerned most settlers, was to be on the British pattern of freehold tenure. The Seigneurial System common in Lower Canada was permanently eradicated in the upper province. Meanwhile the voting franchise was fairly wide, and the assembly numbered no fewer than 16 members while the Legislative Council was made up of seven. The first leader of this new wilderness society was Lt-Gov John GravesSimcoe, whose avowed purpose was to create in Upper Canada a "superior, more happy, and more polished form of government," not merely to attract immigrants but to renew the empire and by example to win Americans back into the British camp. Governmental institutions were established, first at Newark (Niagara-on-the-Lake) and then at the new capital at York (Toronto). Simcoe used troops to build a series of primary roads, got the land boards and land distribution under way, established the judiciary, grandly abolished slavery and showed a keen interest in promoting Anglican affairs. When he left the province in 1796 he could take pride in his achievements — although he had failed to convert Americans from republicanism, and to persuade Britain to turn Upper Canada into a military centre. To Britain, Canada still meant Québec, and Simcoe's elaborate plans for the defence of a western appendage beyond the sea-lanes were unrealistic. Upper Canada did not flourish under Simcoe's successors in the lieutenant-governor's office: the timid Peter Russell, the busy tyrant General Peter Hunter, the scarcely busy Alexander Grant and the lacklustre Francis Gore. It was still a remote frontier of fragmented settlement. And land — the only real source of prosperity — had been carelessly carved up in huge grants by lax administrators. Politics began to emerge in provincial life, bearing the mark of the Constitutional Act, which by its very nature had created a party of favourites. Lieutenant governors chose their executive and legislative councils from among men they could trust and understand, who shared their solid, conservative values: Loyalists or newly arrived Britons. These men (later called the Family Compact) quickly became a kind of Tory club or faction permanently in power. They could not conceive any brand of loyalty to the Crown apart from their own; when opposition arose, as it did frequently over budget matters, those advocating an extension of the shackled assembly's powers were branded, in exchanges of fiery rhetoric, as Yankee Republicans. But the influence of sincere political critics such as Robert Thorpe, Joseph Willcocks and William Weekes was to be washed away in the vortex of the War of 1812. 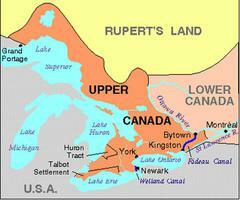 During the war, Upper Canada, whose inhabitants were predominantly American in origin, was invaded and partly occupied. American forces were repulsed by British regulars assisted by Canadian militia. The war strengthened the British link, rendered loyalism a hallowed creed, fashioned martyr-heroes such as Sir Isaac Brock and Tecumseh, and appeared to legitimize the political status quo. The war ended Upper Canada's isolation. American immigration was formally halted, but Upper Canada received an increased number of British newcomers — some with capital to spend. The economy continued to be tied to Britain's colonial trade policies and mercantilism, and the wheat trade gained primacy among Upper Canadian farmers. Still, the province remained capital-poor: for example, the Welland Canal Co, a public works venture, had to look abroad for investors. The expense of administering the growing colony increased substantially in the early 1820s. Schemes to reunite the two Canadas were occasionally considered. In 1822 an effort was made to adjust the customs duties shared with Lower Canada to provide the upper province, which had no ocean port, with a larger share of revenue. Revenues remained inadequate and the province was plunged into debt, unable to pay the interest on its own badly received bonds without further borrowings. The establishment of the Bank of Upper Canada (1821) and other banks failed to bring real fiscal stability, and neither did the contributions of the massive British-based colonization venture, the Canada Company. In fact, Canada Co. payments were used to defray the salaries of government officials (the civil list) and thus the assembly was sidestepped in its desire to control government revenues. The War of 1812 consolidated the political control of the province's ruling oligarchy, whose leading light was Anglican Archdeacon (later bishop of Toronto) John Strachan. Many commentators have labelled the Family Compact corrupt, although recent evidence suggests that the group was rigorous and methodical in its administration and thorough in its investigation of irregularities. It had a strong sense of duty to development, as shown by its unswerving support of public works such as the Welland Canal. But an oligarchy, enlightened or not, was an anachronism in an age in which democracy was becoming the fashion. By 1820 opposition in the province was becoming sophisticated but its politics was not yet dominated by disciplined parties. Some agitators such as RobertGourlay, the celebrated "Banished Briton," had earlier dramatized popular grievances in martyr-like fashion. Until the mid-1830s, opposition was usually led by more moderate politicians such as Dr William Baldwin, Robert Baldwin and Rev Egerton Ryerson. 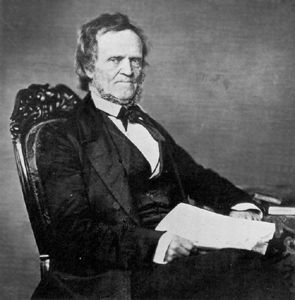 Reformer William Lyon Mackenzie wanted Upper Canada to be a US-style republican democracy, and he envisaged a province composed of firmly patriotic farmers, ready to become British-American revolutionaries. Mackenzie's Rebellion of 1837 — which sought to seize power from the Family Compact and its supporters in the church — misfired because, like so many politicians after him, he failed to understand the basic, moderate political attitudes of Upper Canadians. Mackenzie's violent posturing and his poorly supported rebellion turned out to be unnecessary, since gradual democratic reforms were already underway in both the colony and Britain. The inadequacies of the rigid Constitutional Act were by now apparent. For Upper Canada, real political change could only come from London — although it might be accelerated by advocates in the province. Some immediate change came through the efforts of the earl of Durham in 1838. As governor general of British North America he spent only a few days in Upper Canada, but he found time for a short, formal visit to Toronto and an interview with Robert Baldwin. He also received sound counsel from his advisers, especially Charles Buller, all of which he placed in his famous report (see Durham Report). Durham's report and its recommendations set in motion a scheme that had long been considered: the reunification of Upper and Lower Canada. By 1838 Upper Canada had a diverse population of more than 400,000 people, stretched west from the Ottawa River to the head of the Great Lakes. It was still a rough-hewn and somewhat amorphous community, poorly equipped with schools, hospitals or local government. Durham, from his lofty imperial perch, argued that a reunion of the provinces would swamp the French of Lower Canada in an English sea and, more important, that the economic potential of both colonies would be enhanced and they would thus be less burdensome to Britain. All this Durham insisted would easily be advanced under responsible government, whereby the Cabinet — or executive council as it was called then — is made responsible and accountable to the elected assembly rather than to the Crown and the lieutenant governor. The errors of the Constitutional Act could be exorcised and unruly politics temporized without fear of further revolts. Britain approved the union, although the actual granting of responsible government would take almost a decade more. On 10 February 1841 Upper Canada's short, unhappy history came to an end — the colony united with the largely French-speaking Lower Canada to form the new Province of Canada. Despite their tumultuous history, Upper Canadians could make some claim to having a collective past, and — with the prospects of a rapidly increasing population, greater democracy and improving agricultural opportunities — could look forward to a brighter, collective future. G.M. Craig, Upper Canada (1963).